Thought I would post a couple of photos of a very small part of my collection for anyone interested in Australian pottery. 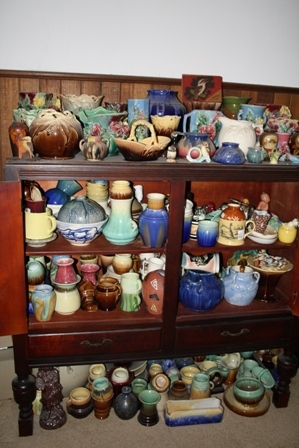 Mostly pieces made by or associated with Bakewell Bros Pottery. The applied flower pieces are made by Daisy Merton who was the main paintress for Bakewells in the 1930's. Also in this picture is a couple of pieces of Remued/PPP, Phillipa James, and Merrick Boyd. Not really on display, just a peek inside one of the cupboards. Top row has some Newtone, Diana, Marutomo Ware (Japan), Mashman and Pates. Bottom row has More Newtone, Ellis, Florenz, Gustav Pillig, PPP, Mashman, MCP, and Daisy Merton. 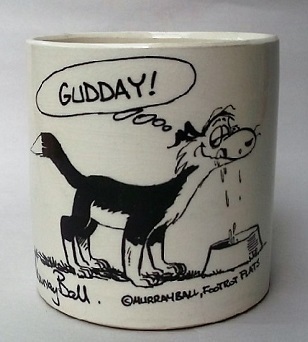 A more recent area of interest for me since moving to Tasmania has been the works of 1970's potter Cynthia Mitchell. I have somewhere around 160+ pieces which are mostly all packed away at the moment but I have been uploading photos to Flickr. I'll upload more when time permits. Remued is a specific pottery line made by the Premier Pottery in Preston, Victoria. As far as I know Premier Pottery started in or around 1929 first marking their wares PPP in a circle, then "Pamela" for a short period before settling on the name Remued. The name Remued comes from Nonie Deumer and is actually her last name spelled backwards. She was wife to one of the founders of the company Reg Hawkins and a major financial backer in the venture. Remued sells well and top quality stuff gets BIG money (Highest price I know of is around $26,000(AUD) for a single piece at auction but I'm sure pieces have traded for more privately). Because of this you will see the name jammed into online auction titles trying to cash in on their name. There is an excellent Remued website run by a very friendly fellow by the name of Peter Watson : www.remued.com If anyone has a piece they think might be Remued or more importantly photos of a piece he doesn't have in his catalogue don't hesitate to contact him through the site. that is a wonderful collection, mine pales in comparison. I joined this informative site a few months ago after discovering there is a fair bit of NZ pottery in Australia and much to be learnt. The top shot actually looks like this (if you open the cabinet doors and move the lounge). Need to have a bit of clear out soon I think. I want to lower the quantity and up the quality. A cabinet or two wouldn't go astray either!